Charlie Musselwhite with his harmonica in hand looks out over the crowd of friends and visitors at the opening of a new exhibit at the Delta Blues Museum. 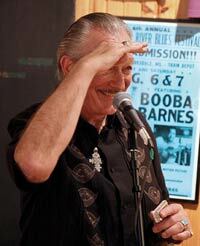 "Charlie Musselwhite: Son of Mississippi, Citizen of the World". The Musselwhite exhibit showcases memorabilia collected through the years. Those who showed up Tuesday evening at the Delta Blues Museum were in for a musical treat from one of the all-time blues harmonica greats. During an opening reception for a new exhibit, “Charlie Musselwhite: Son of Mississippi, Citizen of the World,” Musselwhite performed with his band and mingled with the large crowd of locals and blues enthusiasts. A number of those who gathered to see the exhibit were blues fans/tourists soaking up as much of Clarksdale as they could following the previous weekend’s Juke Joint Festival. John Henshall, a city planner from Australia was one such individual who said he credits an encounter he had with Musselwhite as part of the reason for returning to Clarksdale in 2008 for an extended visit. Since first emerging on the blues scene in the late 1960’s, Musselwhite, who is a native of Kosciusko, has been forging a career earning him international admiration and respect. Among Musselwhite’s many albums is the 2006 Delta Hardware –– named after the building he owns in Clarksdale on Sunflower Avenue –– which was selected by Amazon.com as the Editors' Pick for Best Blues Album of 2006. Tuesday’s exhibit opening was sponsored by Coahoma Community College and Friends of the Delta Blues Museum. The exhibit was funded in part by the Mississippi Arts Commission, the Rock River Foundation, the Chisholm Foundation and Friends of the Delta Blues Museum.